Beech are highly prized for bonsai because of their characteristic white bark, beautiful foliage, winter hardiness and easy training. There are several beech species native to Japan. 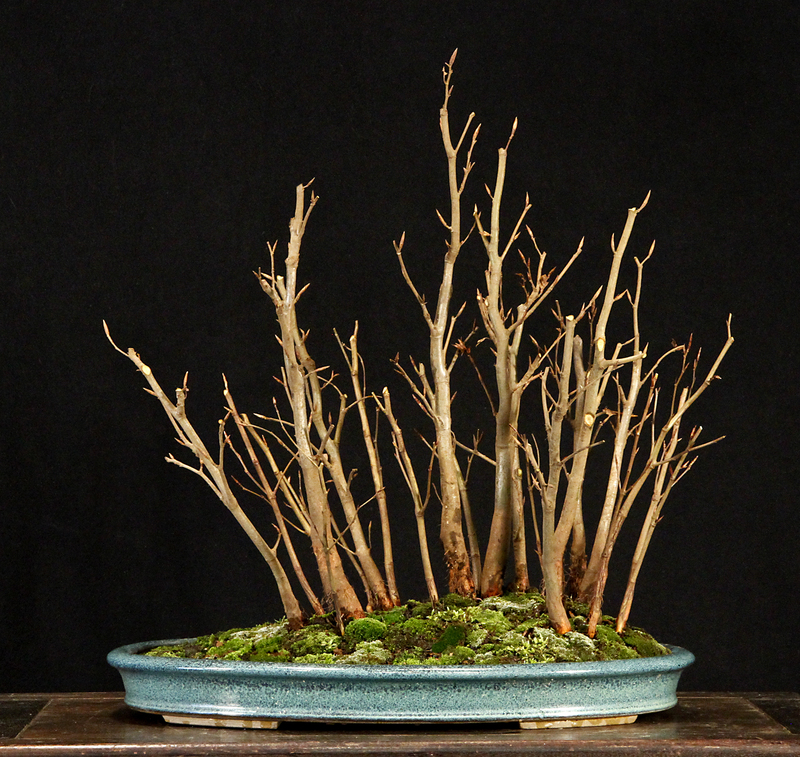 The Japanese beech, Fagus crenata is the most commonly trained species for bonsai in Japan. Specimens near Mt. Fuji are especially valued because of their small thick foliage. 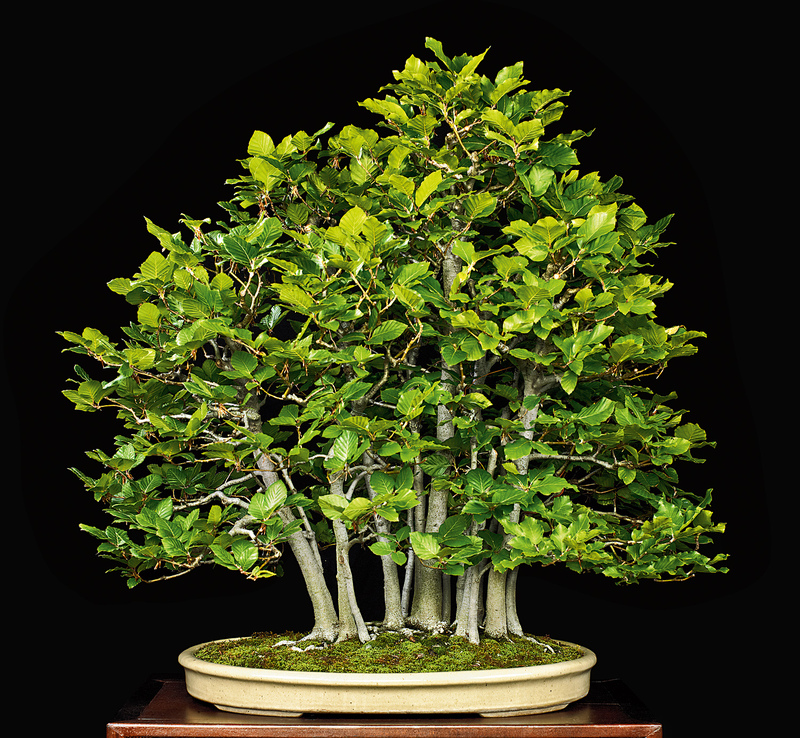 The American beech, Fagus grandifolia, has rather large thin foliage and often collected specimens are grown for bonsai. 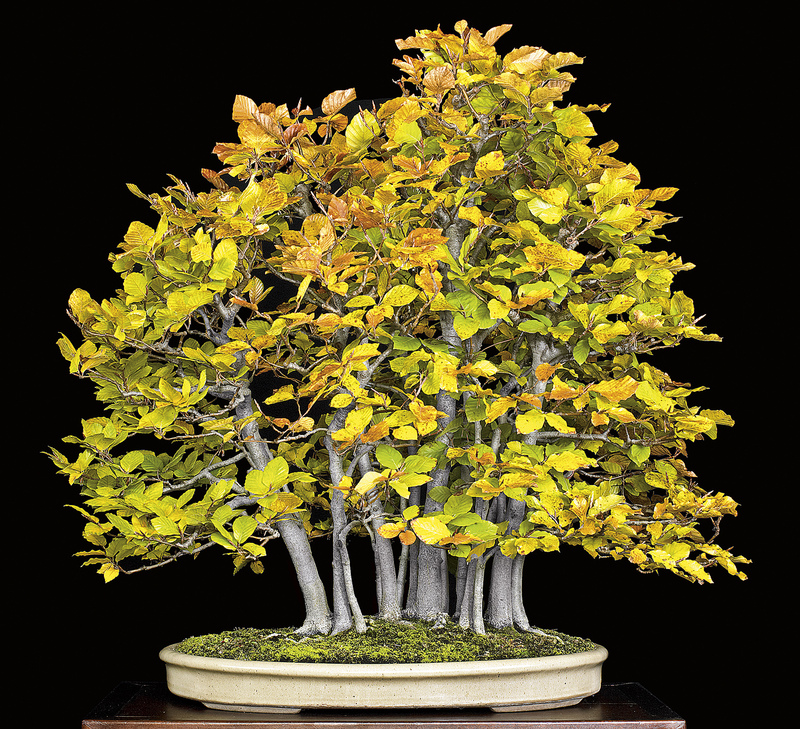 The European beech, Fagus sylvatica, is trained for bonsai in Europe and spectacular bonsai are created from thick trunked collected trees. In the United States European beech, and its numerous cultivars are commonly used in the landscape for different colored foliage or unusual growth patterns. 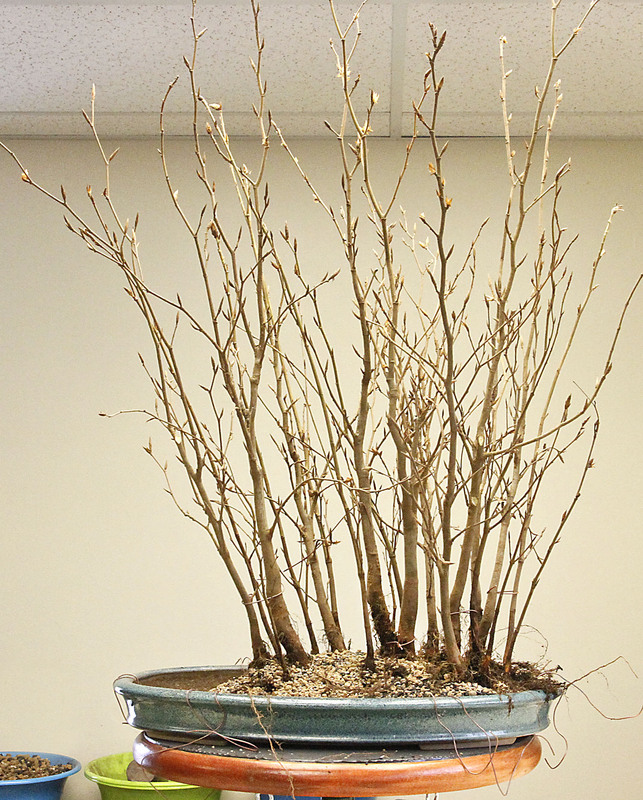 These cultivars are usually grafted onto seedlings of European beech, so they are a widely grown nursery stock. The normal leaf size of European beech is a bit larger than Japanese beech. Although individual seedlings vary in leaf size and character, European beech mostly have thick leathery foliage, which quickly reduce in size. Whitish bark quickly develops in approximately six to ten years. A few weeks ago I received a nursery offering for one to two foot European beech seedling transplants with low branching for hedges. European beech are often used for hedges in Europe and old estates in the United States. The offering sounded great and 150 sample trees were ordered. 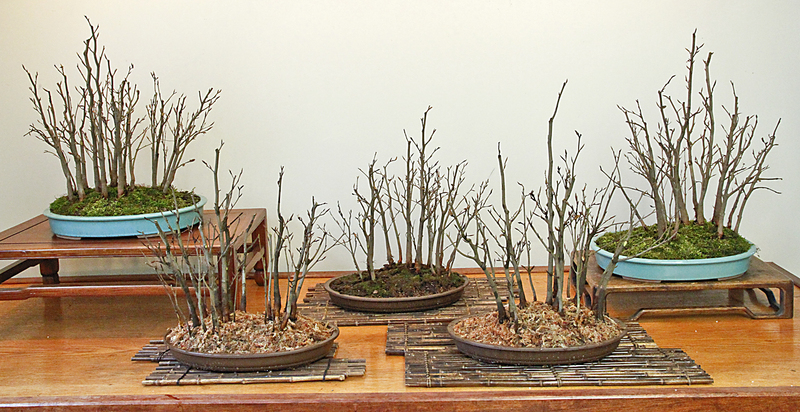 They were intended for single tree workshops for my next year’s Introductory Bonsai Course. 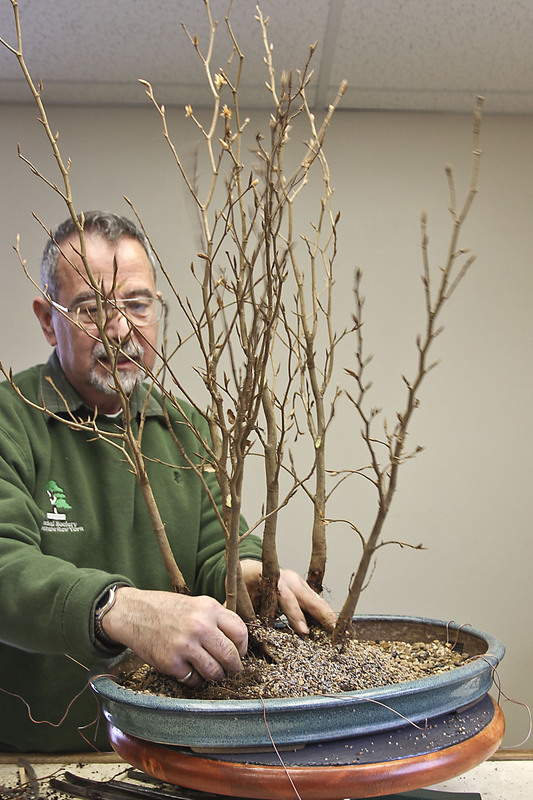 Upon arrival, after inspection, the branching was not ideal for single tree bonsai, but excellent for forests. I was quite excited about the shapes of the new plants and immediately created five European beech forests of different designs. 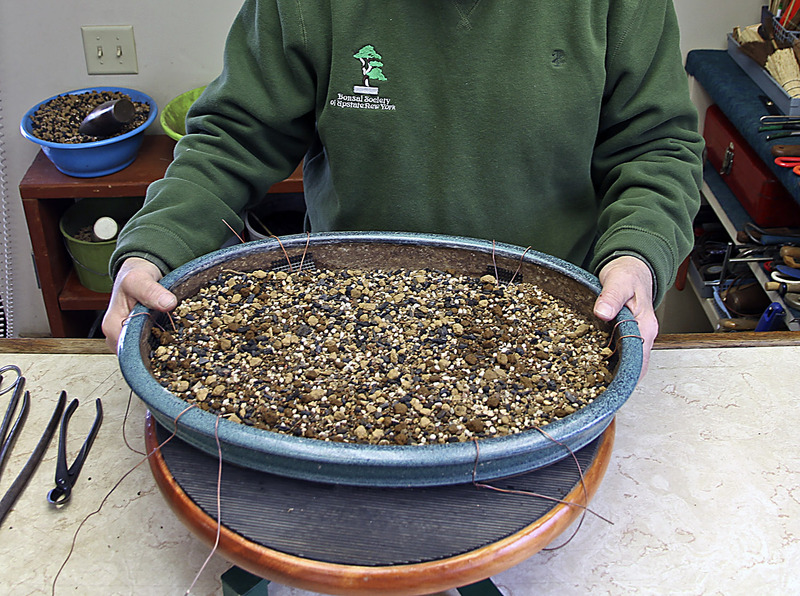 Only a few of the seedling transplants were selected for single trunk bonsai. 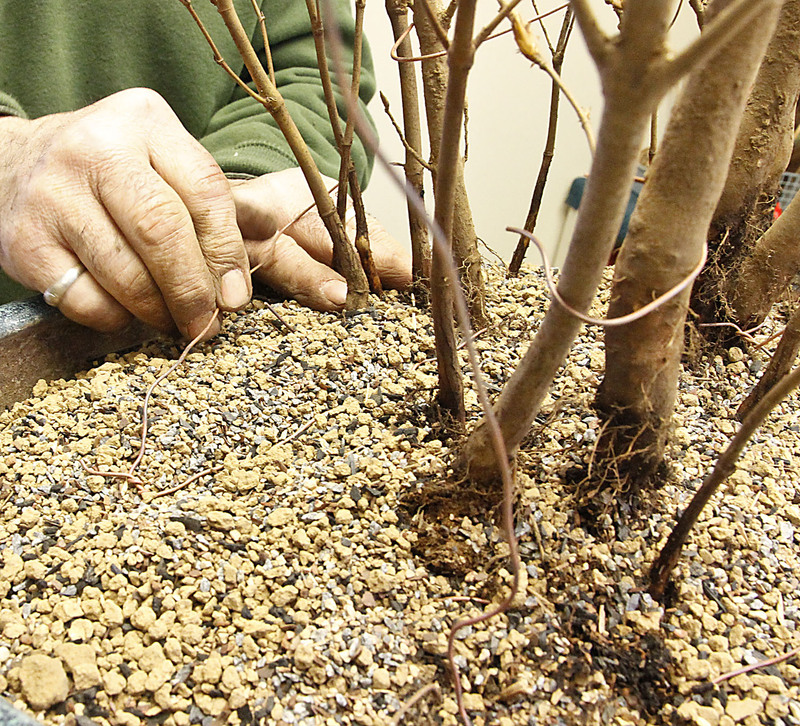 Since I was working alone I did not take the time to photograph the process of creating a forest bonsai. 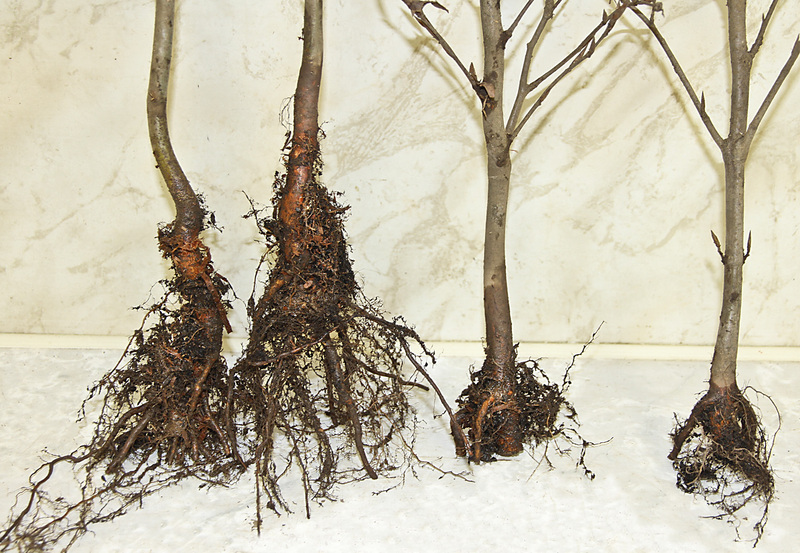 The five forests came out great and have the possibility of developing into future fine bonsai, so I ordered another 100 seedling transplants to make another forest with a friend photographing the creative process. The seedlings arrived last week, but I did not have an opportunity to create the forest because I was preparing for my new Classical Bonsai MasterClass. 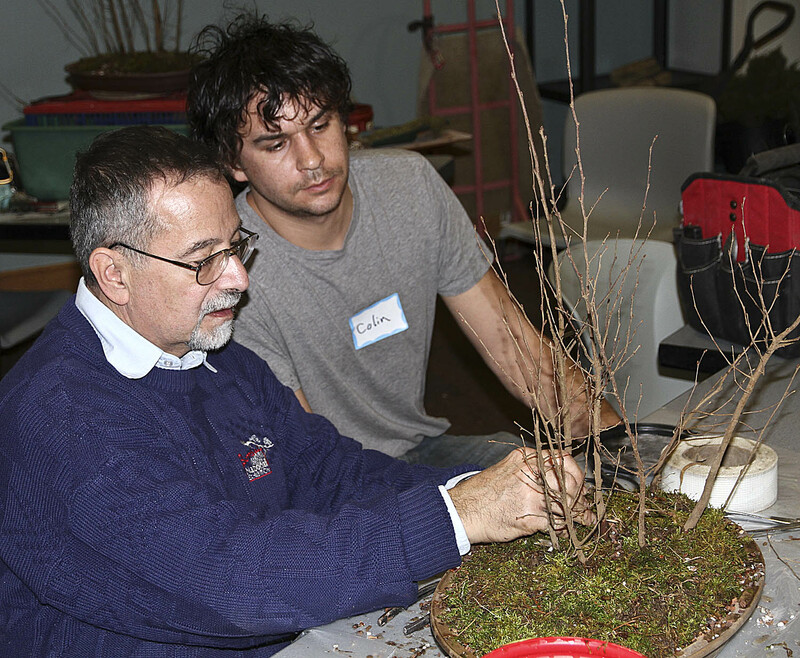 Three of the four students arrived a day early to drop off their bonsai and since my preparations were complete I seized the opportunity to create the European beech forest while presenting a private demonstration lesson for the early arrival three students. 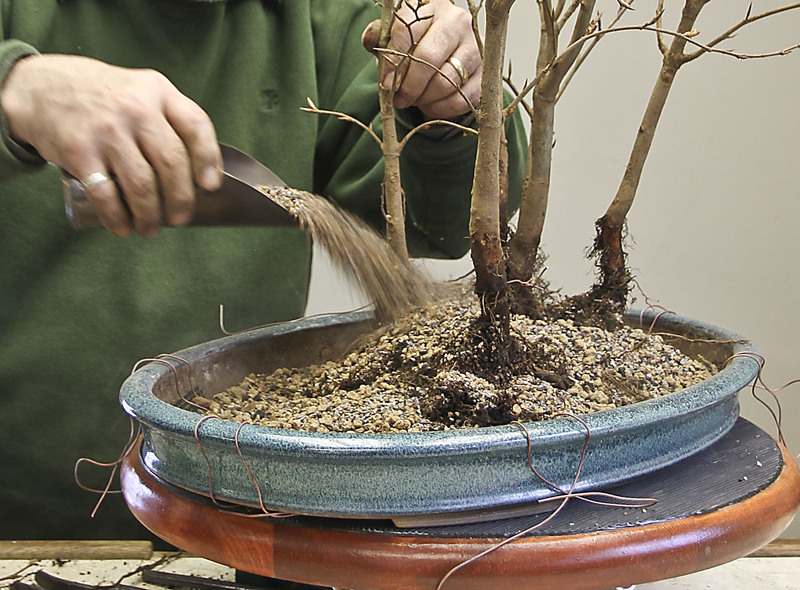 The first step in creating a forest, rock planting or any bonsai is to prepare all the material ahead of time: trees, container, wire, soil, tools and moss. I like oval containers for forest plantings because they do not have difficult corners to aesthetically use. Shallow containers are best without prominent feet. A flat foot is better than cloud feet to provide a solid visual anchor. Beech is a deciduous species and I personally prefer an outer lip because of the flat foliage. Although unglazed containers can be displayed year around, I selected an old Japanese Tokoname-ware container from the Suishoen Heikisui Kiln. This container has been used for several bonsai from my garden during the past 30 years and has history. When selecting the container I was thinking about respect and came up with another interesting article on the topic. Rather than take up the time and space here the topic will be in a forthcoming blog entry, or magazine article. After selecting the container, notice that it has been cleaned inside, but shows antiquity, drainage screen is placed over the holes. 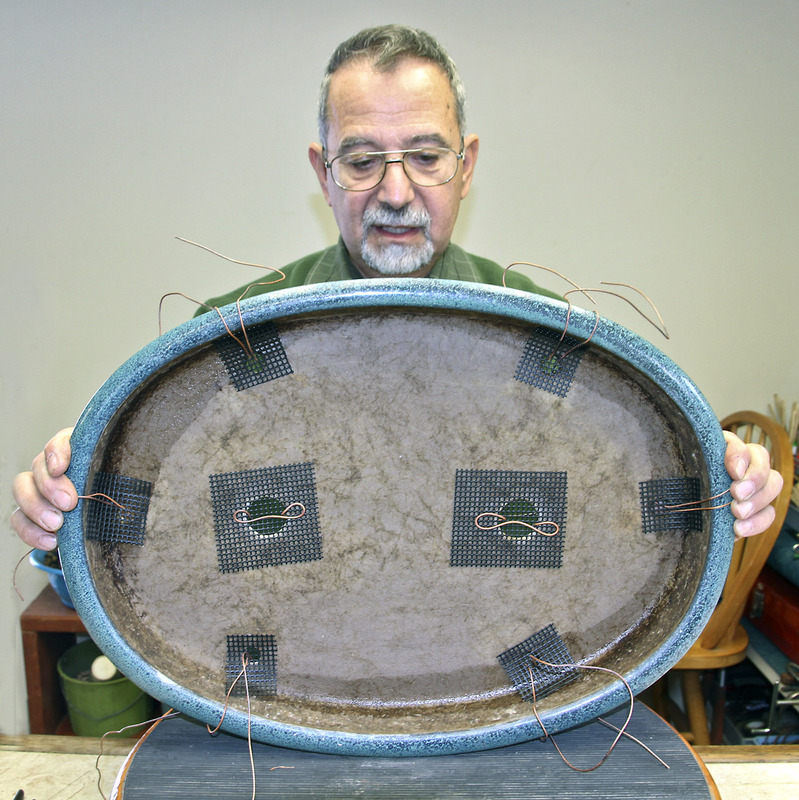 Although nearly everyone who grows bonsai takes the time to secure the drainage screen over the holes to prevent movement when potting with pieces of short copper wire, I do not. 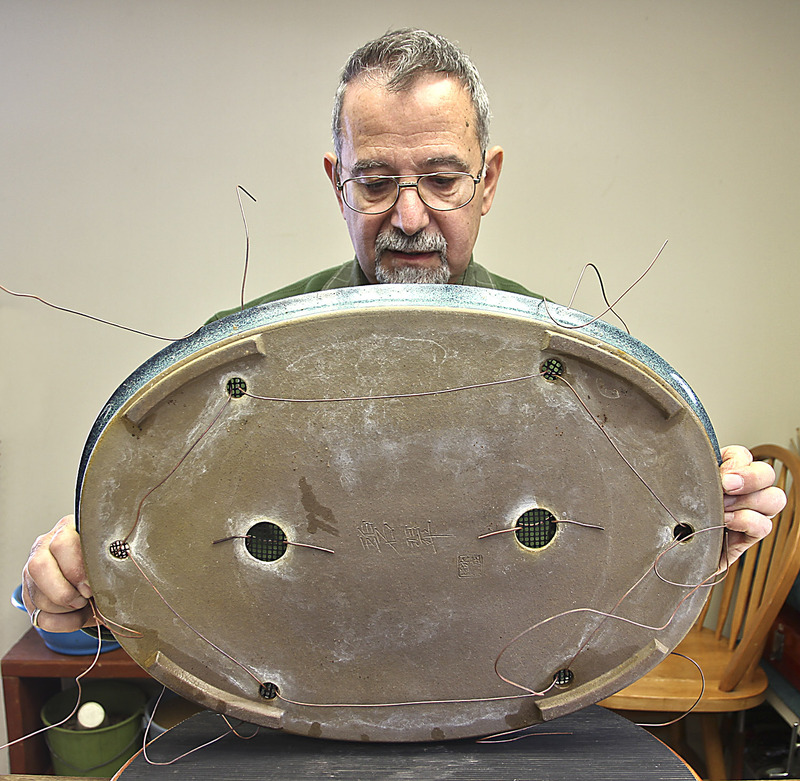 I have learned through decades of experience that it takes time to make and insert the wire and it’s easier and cheaper for me to simply use a larger piece of drainage screen over the holes. 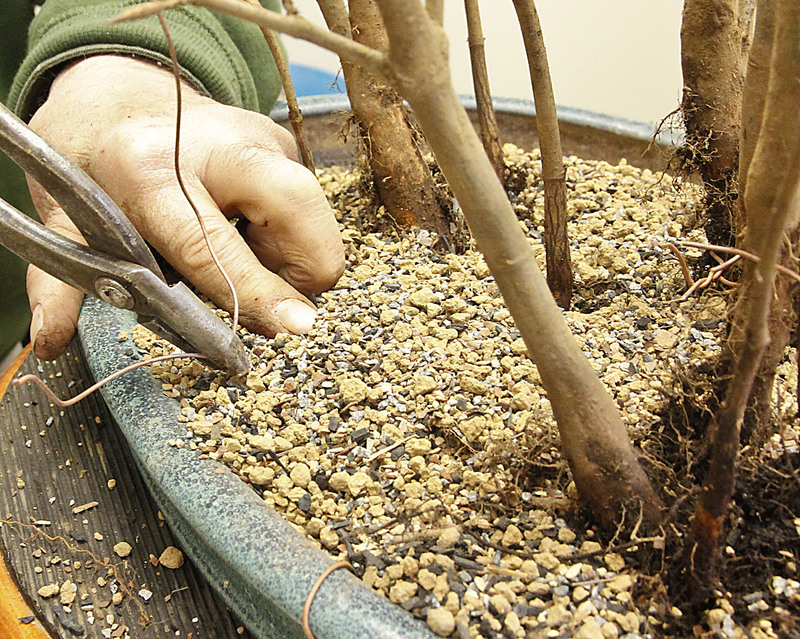 When potting my bonsai, usually most of the holes have copper wire to tie the tree into the pot. If carefully positioned, they will hold the drainage screen from moving. 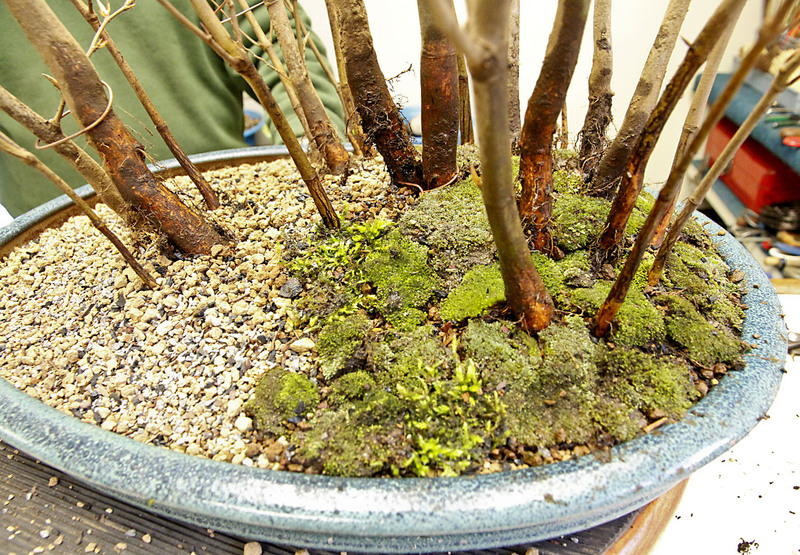 However, for this forest bonsai (mostly for demonstration purposes) in addition to using a larger piece of drainage screen, I added small copper wire clips. Copper wire for holding the trees into the container were used, lots of them. It’s better to have too many wires than not enough, although extra wire can be always added to secure stubborn trees that want to move around. A small layer of coarse bottom soil was placed into the container, which was set aside until later. The shipping box of the seedling transplants was then opened outside where the sunlight was bright, a rarity in Rochester this year. Each bundle of ten trees was cut open and every tree was studied. Again a few more specimens had suitable shapes for individual bonsai, while the others were graded into large, medium and small sizes. They were graded by trunk diameters, not heights, because they can easily be trimmed down or grown tall, but the trunks thicknesses are more difficult to change. 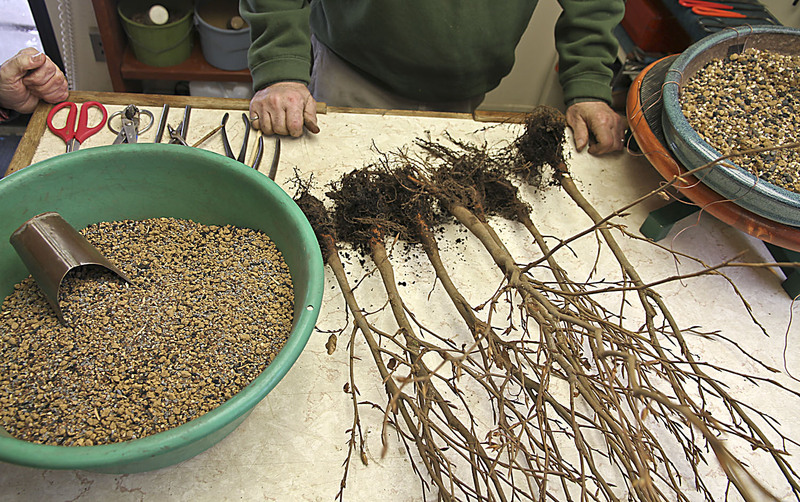 The graded seedlings were brought into the studio and root pruned. 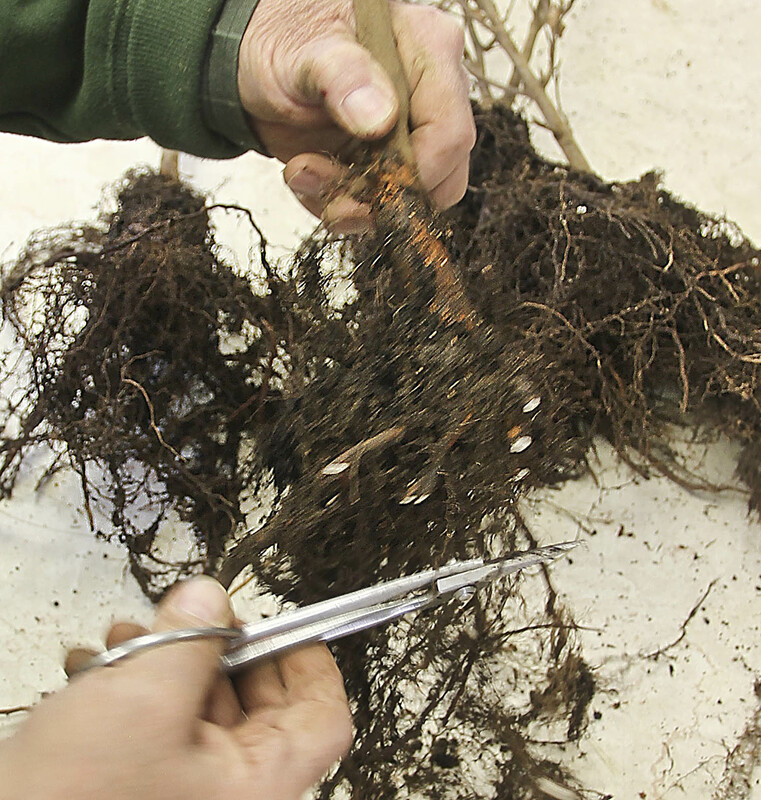 Long and heavy roots were immediately pruned short. 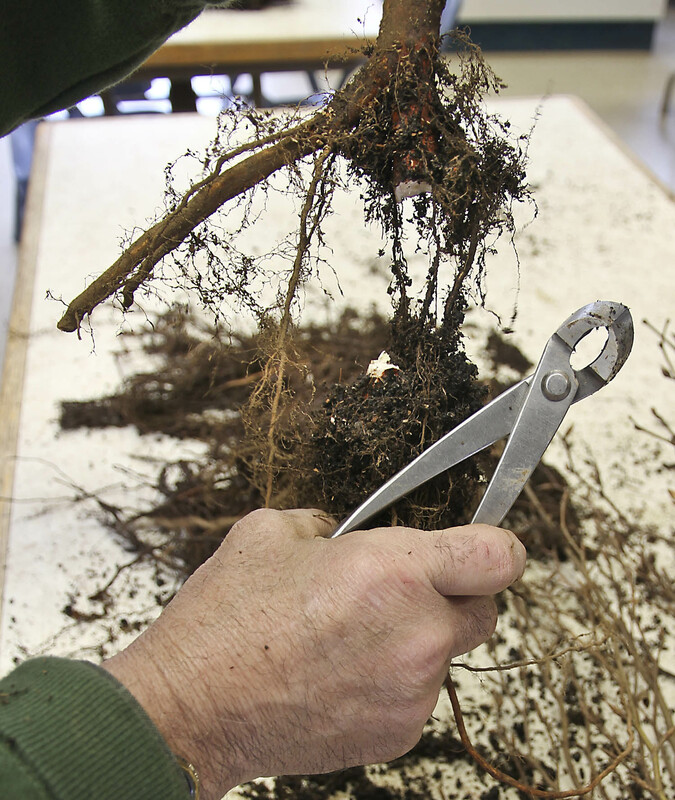 Sometimes seedlings will develop two root systems and the lower one is often removed. 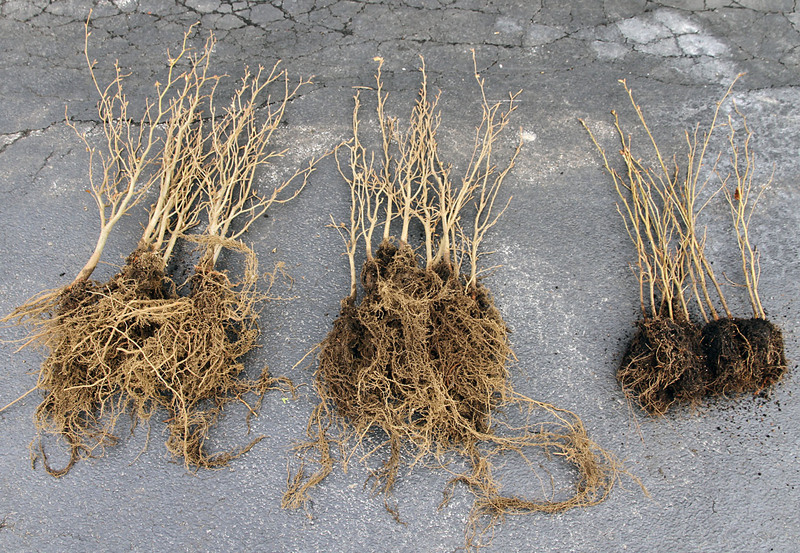 But, it’s important to study all the roots, sometimes the upper roots are removed because the lower level root system has better distribution or finer roots. These are young deciduous seedlings that are vigorous, especially at this time of the year. 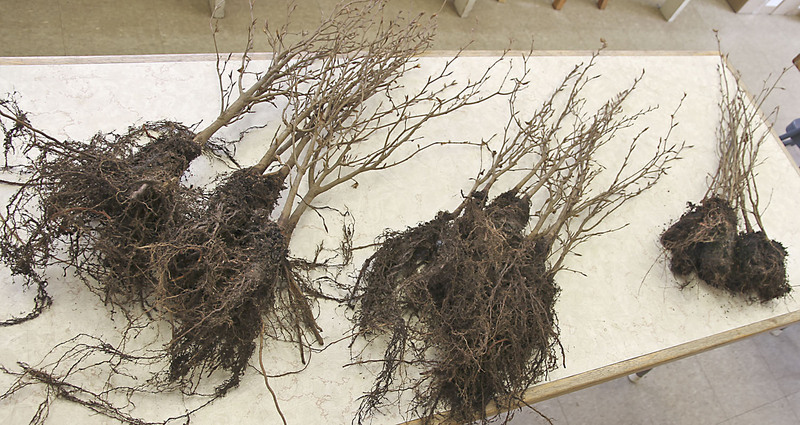 They do not need a large number of roots at this stage. Most of the top growth will be shortened after positioning. 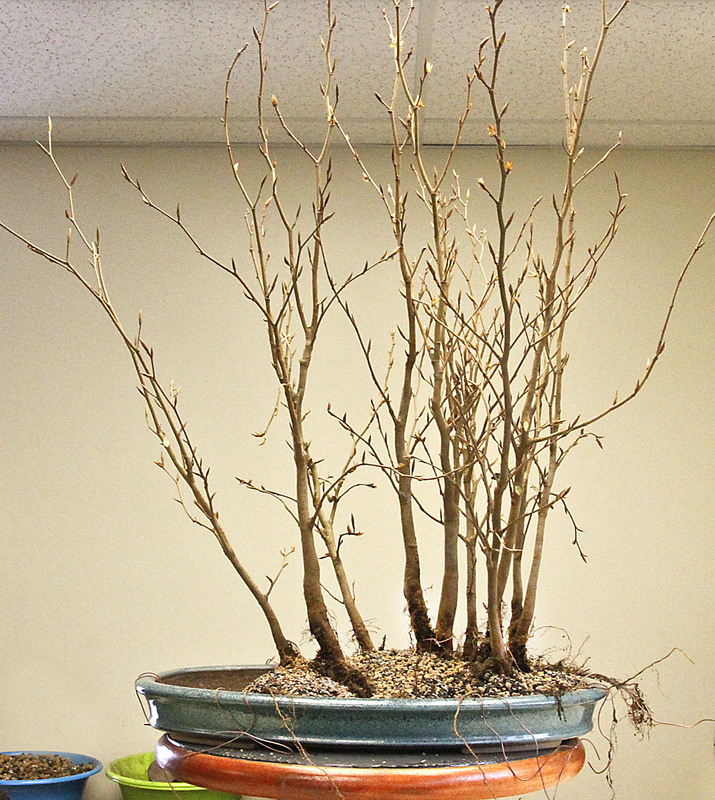 One of the advantages of using young deciduous seedlings is that they can be positioned closer together than potted specimens with a larger root system. 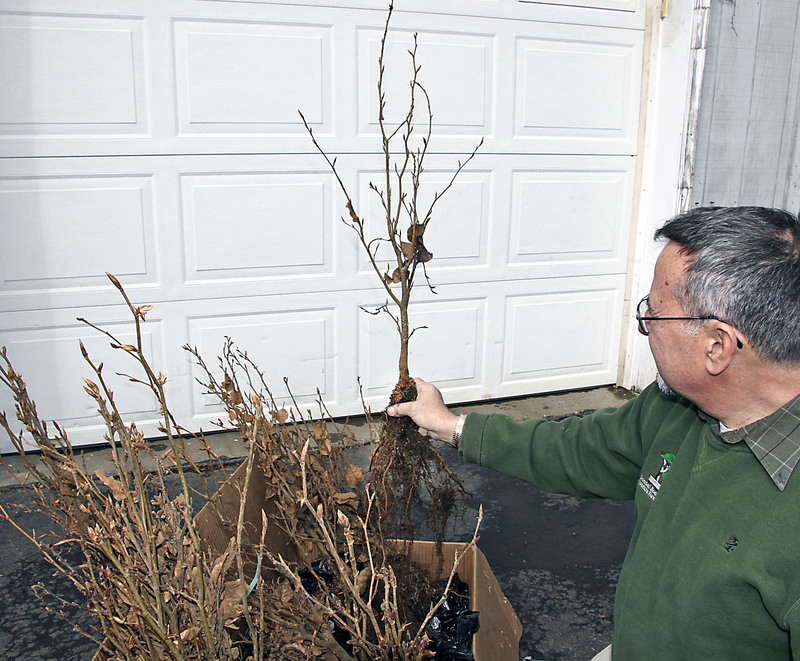 Again, after root pruning, the trees were graded and placed into three groups: large, medium and small. 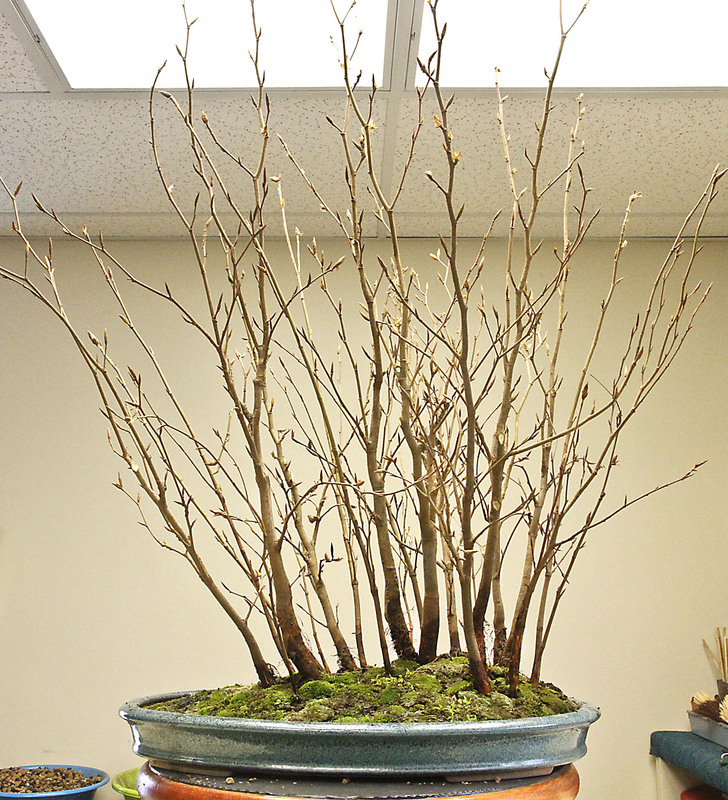 The basic design of a forest bonsai is actually created by the position of the main larger trees. If a larger tree is not available, two trees can be planted close together to appear as one large specimen or the tree can be planted a bit higher in the container. 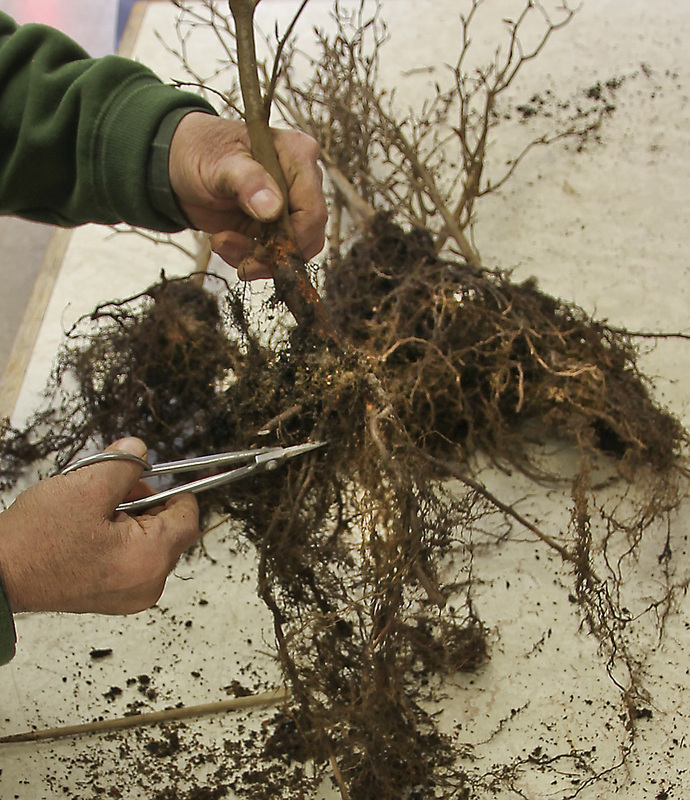 After carefully placing the trees into the container, soil was added around the roots to keep the trunks from falling over, remember, they do not have many roots. 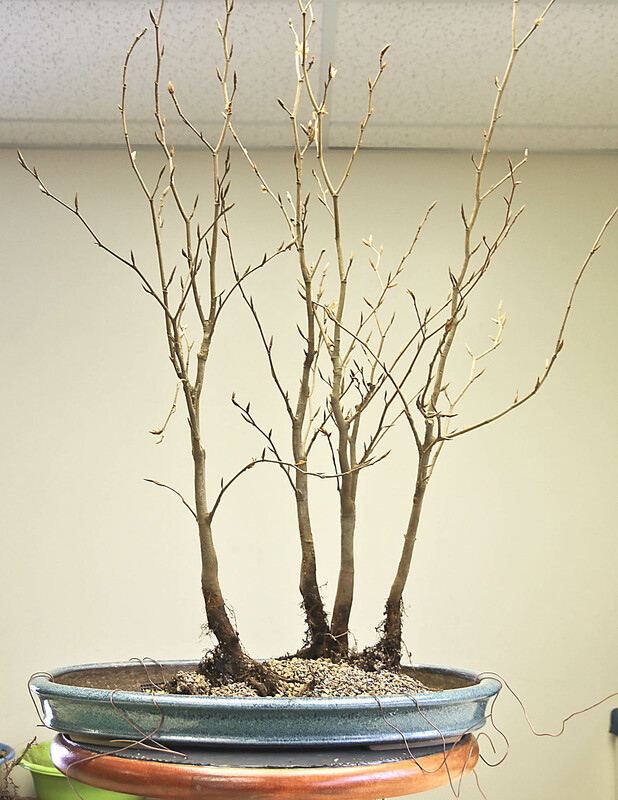 A small amount of water from a hand sprayer will add weight to the soil to help stabilize the trees. Also, often times two or more trees are tied together at the base of the trunks. And temporary wire is usually used in the upper sections of the trees to keep the trees from moving. 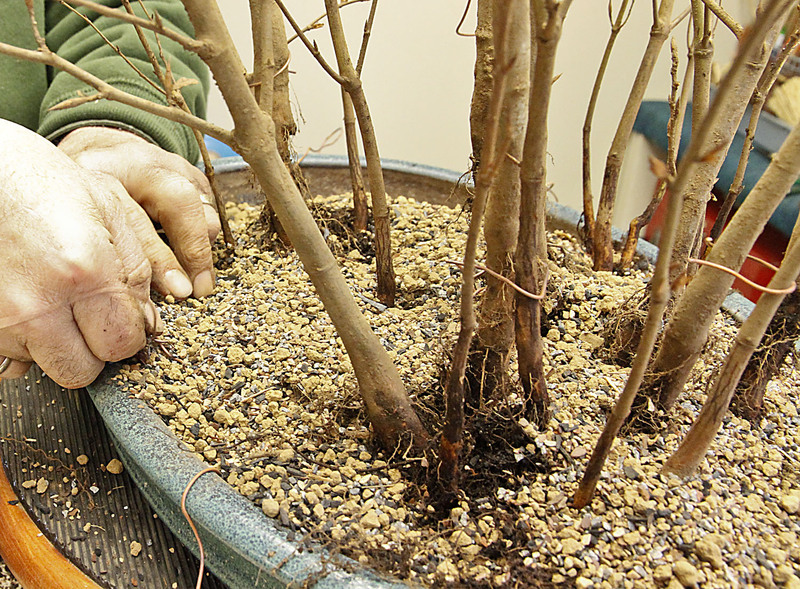 Additional medium size trees are then used around the larger specimens working toward the container rim. First position the trees for similar trunk movement, keeping in mind any small branching the trunks might have. Ideally the branches should be positioned so they grow towards the outside of the forest, not inside. I do not usually prune the heights or remove inner branching until after the forest is completed. Please note that the trunks were not wired at this time. 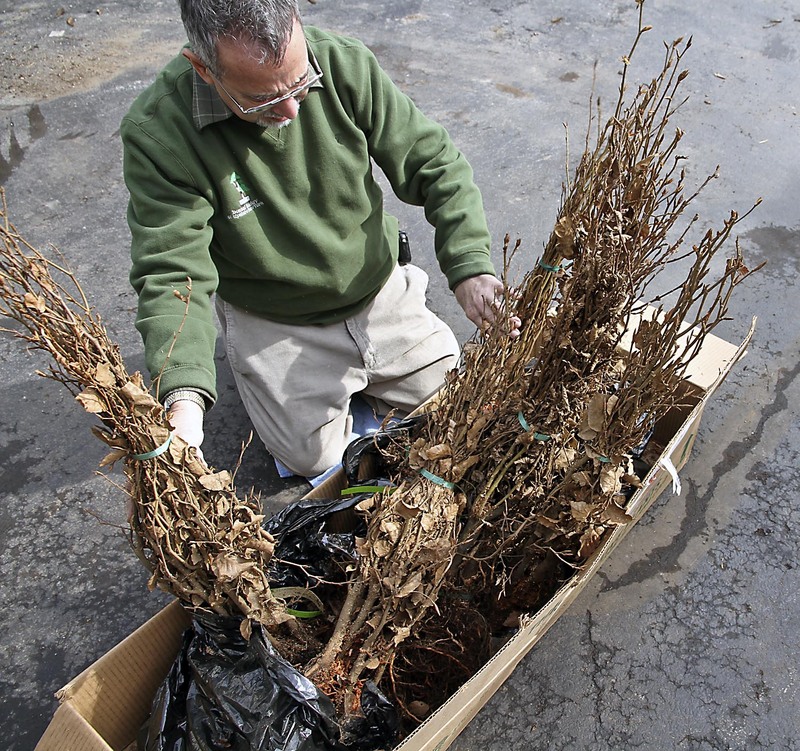 If necessary, they can be wired or refined during the summer or even best next year. I have learned, the hard way, that if you only wire one or two trees, they will look so good that you continue on and eventually wire all the trunks. So, either wire all or none of the trunks at this time. A distant view design will be used for this forest bonsai because of all the lovely similar seedlings. The main tree is positioned towards the center of the composition and the beauty of the bonsai lies with the delicate branching the trees will develop. Finally the smaller trees are added to the group. 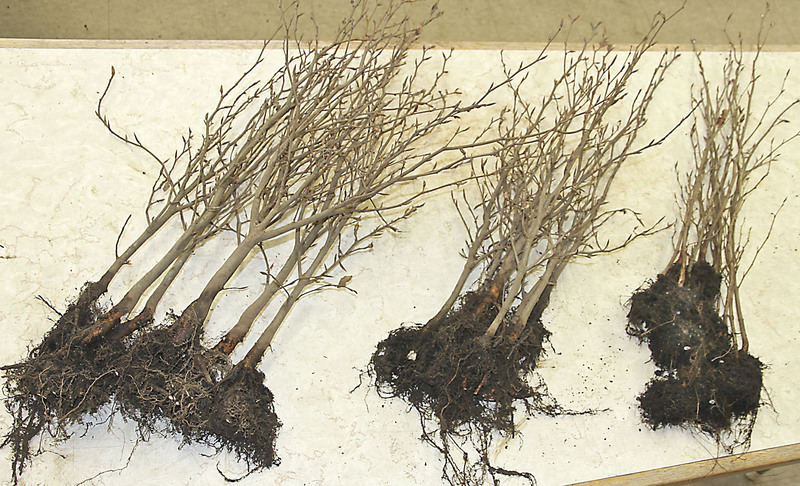 I also looked through a few of the European beech seedling bundles we mail order for even smaller trees. This forest actually had four different sizes of seedlings to present a wider range of trunk calibers and heights. After enough trees were added to present a pleasing forest they were secured using the copper wires inserted through the drainage holes. I never counted the number of individual trees in this forest. The actual number is not important because the normal human eye can’t easily count more than eight trees at a time in a forest planting. Basically, what I was aiming for is to have most of the larger trunks around the main tree on the right and positioning them closer together than the other trees near the smaller trunk trees on the left. 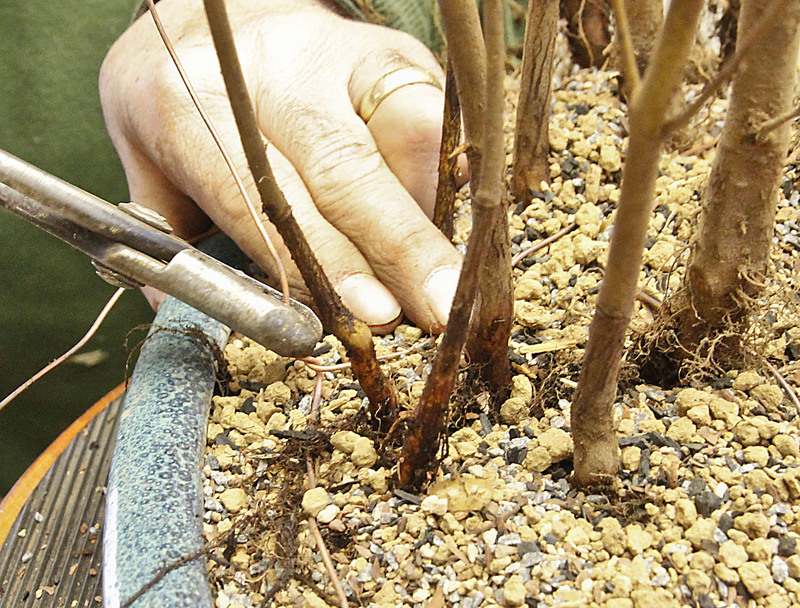 The wires run through the planting and are tied with a wire pliers making certain that both ends of the wire are twisted together at the same time. The ends are not trimmed until the end, because they are often handy for tying to each other for additional support. 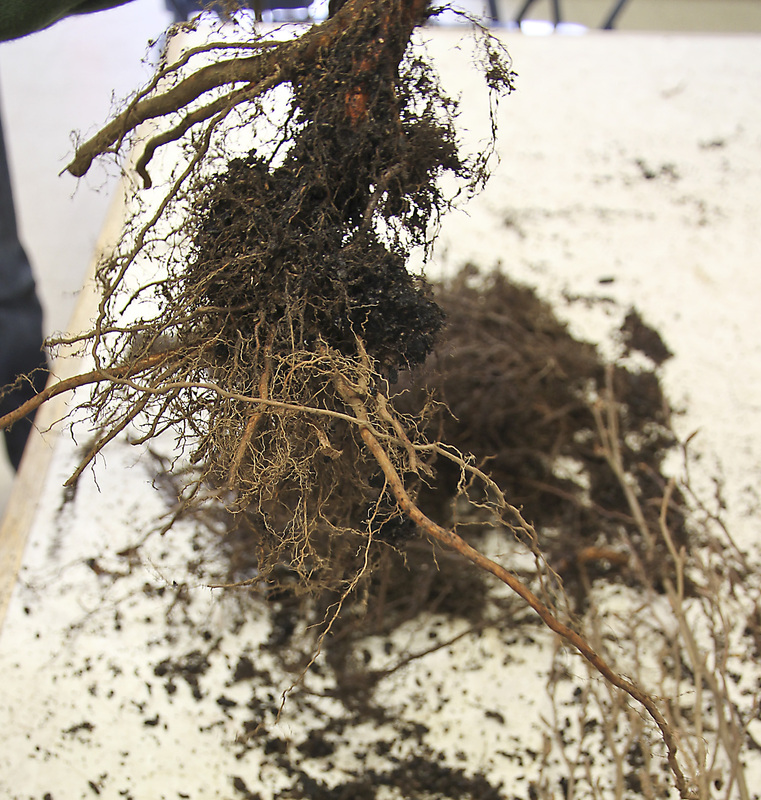 Soil is then added and carefully placed around the roots. 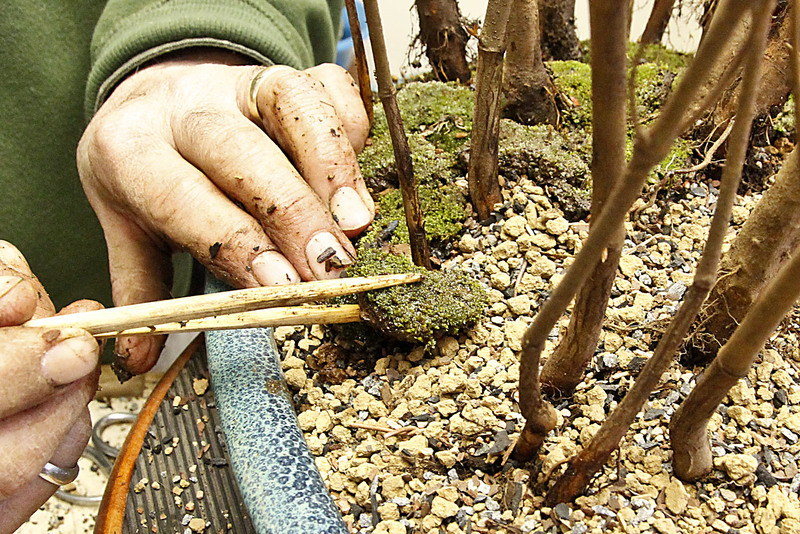 Next moist green moss is applied in small pieces first around each trunk base. 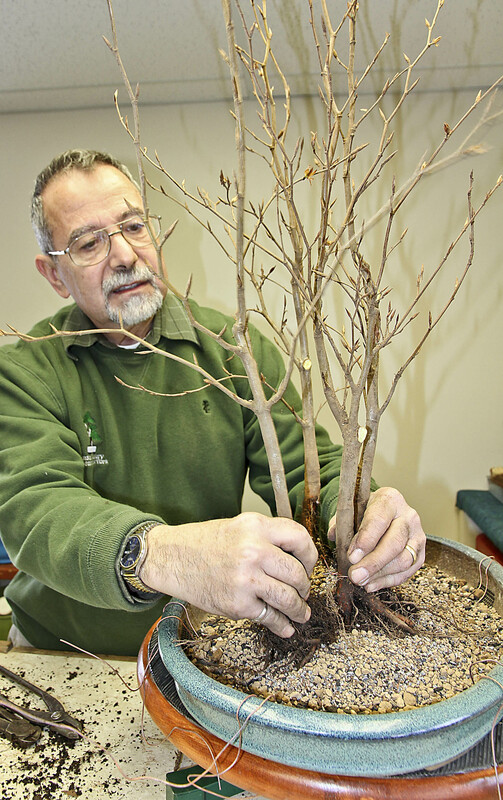 It is gently pressed into the dry soil to secure the trunk positioning. While doing this, each trunk is again adjusted and can even be rotated for better viewing from the front. All the moss is placed next to each other without gaps to hold the trees in position. Once the moss has been completely planted the trees are trimmed. 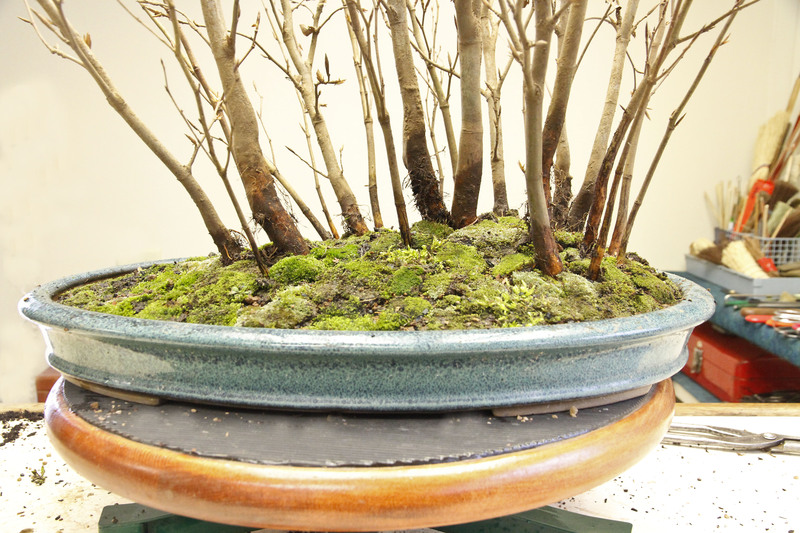 First the height of the forest bonsai is established as well as the sides. Then all the other trees are trimmed to different heights, keeping in mind the heavier trunks ideally should be taller than the skinny trunks. As adjusting the tree heights inner growing branches are removed. Trees can still be slightly positioned at this stage of development. It’s important to remember that when the planting is completely planted it is only the beginning of its development for a future forest bonsai. After completing the planting the wire on the bottom of the container is twisted to lock the plants into final positioning. They must not move around. Additional small pieces of thin wire might be added to the tops of the trees to keep them from moving. The planting is watered from the top with water and Superthrive until it runs clear through the bottom drainage holes. 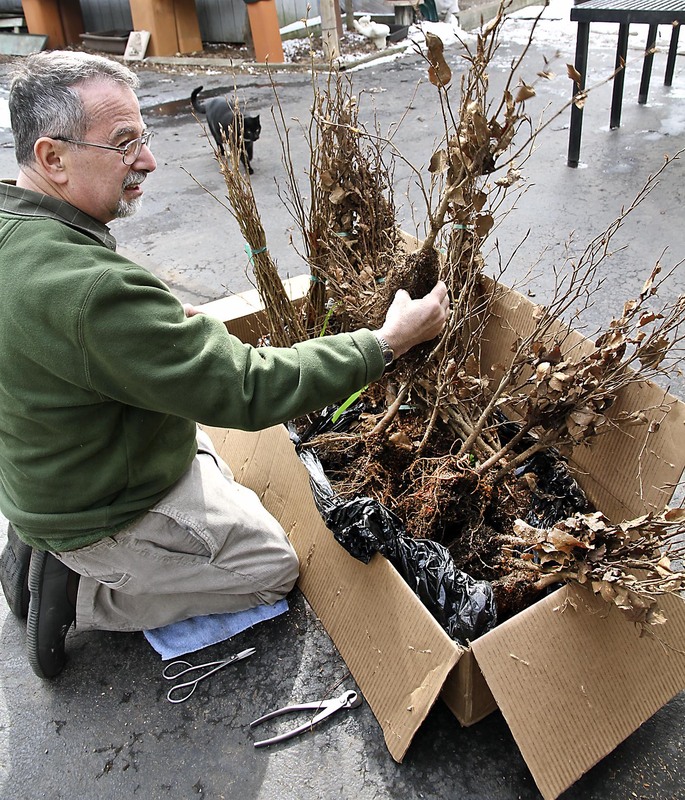 Then it is placed in a sunny area, out of the wind until new buds grow. These are the identical techniques and theory I teach when presenting educational programs around the world. My next Group Planting Seminar will be held on Saturday, April 5, 2014 in Rochester, New York.